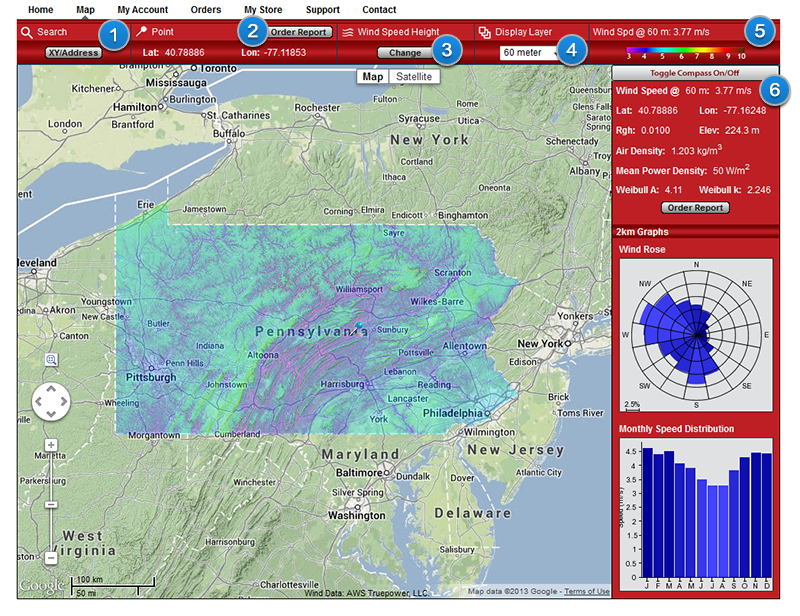 Use of the St. Francis Wind Explorer is restricted to the state of Pennsylvania. Wind and met speeds will only be available where the map has a colored overlay. Clicking in the map will place a marker down so you can order reports for a location, or see detailed statistics if you have a subscription. 1. Search by XY/Address: Clicking on this button will let you zoom to a position by entering latitude and longitude, or by entering a street address. You can also generally zoom on the map to a point of interest. Please note that the overlay will disappear if zoomed in too far. 2. Point and Order Report: The coordinates in this box represent the coordinates of the placed marker. To order a report, click the Order Report button and fill out the form. 3. Change Wind Speed Height: This is only available for subscribers. By clicking on this button and typing in a new height, you can change the default height that wind speeds and met data will be shown to you. For non-subscribers, the value is set to 30m. 4. Display Layer: Shows the closest display layer to the layer entered in "Change Wind Speed Height". 5. Wind Speed and Legend: The legend will provide you with a graphical representation of what color corresponds with what average wind speed on the overlay. The Wind Speed bar will tell you the average wind speed at the selected height for the location that is marked on the map. 6. Compass: The compass contains wind data relating to the location marked on the map. The values listed in the compass are: wind speed, latitude, longitude, roughness, elevation, air density, mean power density, Weibull A, and Weibull k values. Along with these values are a wind rose which shows the percentage that wind was blowing in a certain direction and the monthly speed distribution which shows the average wind speed for each month. The compass can be toggled on or off by clicking the button at the top of the compass. A subscription to the compass is available by going to the My Store link above the map interface. 1. Report Title: Here you can enter the name you want printed on the front page of the report. This will also help you identify the report in your Order History. 2. Created For: This is where you would put your name, or your company name, that will be printed on the front page of the report. 3. Turbine Manufacturer: This dropdown lists all of the manufacturers of turbines that we have in our database. The left turbine column is for the primary turbine and all fields are necessary in order to generate a report. 4. Turbine Model: This dropdown lists all of the models of turbines from the manufacturer that you selected in the dropdown above this one. 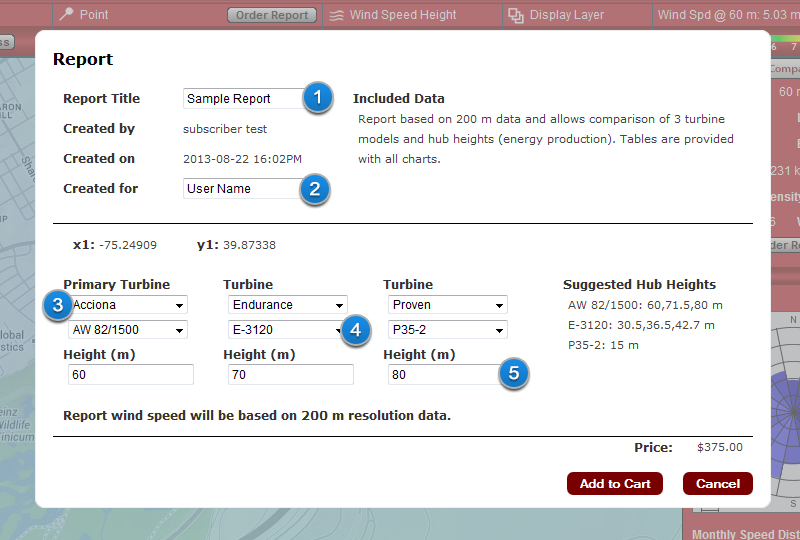 In this example, the Endurance E-3120 turbine is the second turbine that you will receive in your report. 5. Turbine Height: Here you can enter a hub height for the turbine that you chose above. Valid values are between 10 and 100 meters. In this example, the entered hub height is 80 meters for the Proven P35-2 turbine. To begin the order creation process, add any number of items to your cart, then click the cart icon in the upper-right part of the page to go to the Cart screen. 1. Add/Remove Checkboxes: Check or uncheck these boxes to add or remove an item to the current order. You can also use the "Add to Order" and "Remove from Order" text links in the item's box. 2. Report Information: Here you will see the name you chose for your report as well as information about when the report was created. 3. Report Options: Using these text links, you can add or remove an item from an order, delete the item from your cart, or change the details of your cart item (such as name or turbines). 4. Price and Details: On the right side of the cart item box is the price of the report and a link that will let you view all of the details of the order. 5. Total Price and Check Out: The total price of your order is listed here (before any applicable taxes) and the Check Out button will create your order and prompt you for your payment information.